Delta Airlines recently opened a new route between Amsterdam and Salt Lake City, offering Europeans easy access to some of the best Ski resorts the USA has to offer. 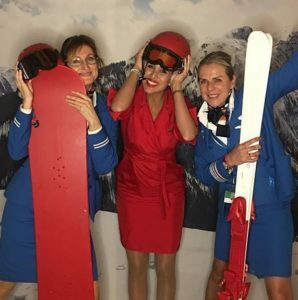 To help launch the route KLM and Delta hosted a winter themed event housed in an aircraft hanger in Amsterdam. From an Ice Ring to Ski Chalets they created a magnificent snowy wonderland. Hashtag Printing was brought in to help with creating branded images that all the guests could take away. Adding a Hashtag Printer to a launch event is a great idea, not only does the brand receive a social media engagement boost throughout the event but the take away prints complete with branding are something the guests keep and look back on long after the event is over. If your planning a product launch or corporate event get in touch for details how we can help.